Today we will see the top 10 blogs with there monthly income, available on the web. Some websites are hosted on blogger platform and some on WordPress. But ultimately they are blogs. Today blogging is not the new term. Approx 40 million new blogs are created every month. Most of them are hosted on blogspot platform as hosting is free. But that doesn't mean that people are not using WordPress, over 60 million blogs on world wide web are hosted on WordPress platform. Blogger.com was founded by Google in 1999, while WordPress was founded in 2002 by Matt Mullenweg and since then blogging term has become a very popular on the web. Many of us interact with blogs on daily basis knowingly or unknowingly. Some of us write blogs, some contribute, some learn and comment. Ultimately it has become a great source of learning today and profession for many. People select their niche. Niche is something on which they can write. It can be Tech, Entertainment, Social media, Money making, Gadgets, Movie reviews, Fashion blog etc. People have made blogging their lifestyle, their livelihood. The blogosphere is surely competitive but still there is lot of space for you to show your talent. You can select blogging as a part time job too. 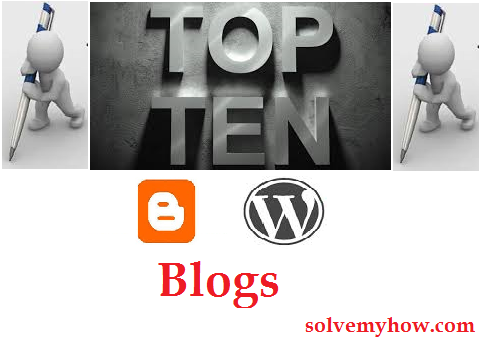 So, lets see the top 10 highest bloggers earners/richest bloggers and their top 10 blogs. Here I will just write the blogs names with there monthly income and founder name. But if you want to read more about that blog. Then simple click on the title or you can also click on read more >> ! So, these are the top 10 blogs and richest bloggers in the world. Most of them are almost going to complete decade. We would appreciate their efforts. Hope you guys love reading this article and surely got inspired from this. Please share it with your social media friends and go ahead start blogging today, get help from SolveMyHow blogger and WordPress categories. Also connect with SolveMyHow on Facebook and subscribe for SolveMyHow newsletter to get blogging tips with inspirational articles right into your INBOX ! No doubt about your work, great man you are doing really something different and solving people problems. Thanks once again. Glad to hear this.